The Pipe Labyrinth Behind "Lost"
It'd have been hard to imagine and understand "Lost" 15 years ago. Its apparently unlimited hyperlinked stories and easter eggs, connected to a gazillion fan files, is only possible because of technology. Amelia Beamer describes the hypertext labyrinth behind it. This article by independent scholar Amelia Beamer was originally published in issue #101 of the British peer-reviewed journal Foundation: The International Review of Science Fiction. I want to examine the popular ABC TV series Lost as an example of a recent cultural creation, that of the hypertext narrative. For those not already familiar with it, the series involves a large cast of characters marooned on a tropical island after a plane crash. It is a character-based narrative: episodes thread lengthy flashbacks of characters' backstories with immediate plots of day-to-day survival and interpersonal relationships, and a larger "mythos" involving the strange and apparently supernatural (or science-fictional) happenings on the island. I will argue that, though television as a medium is linear, Lost is essentially a hypertext narrative, interested in the side-to-side transactions and common histories of the characters, and that its hypertext content also plays with genre protocols, pop culture, audience interaction, and even the nature of storytelling. We all know the basic definition of a hypertext narrative. In Lost, the connections between characters form the essential hypertext content, which is emphasized by the structure of flashbacks that give the viewer privileged information about characters. I'd like to posit that hypertext as seen in Lost is an example of a narrative technique which cross-references character, theme, genre, and elements of parody. Paramount are the connections unfolding between characters, ranging from mundane, apparently coincidental meetings in the airport, to more unlikely and in-depth meetings, reaching back through their entire lives and the lives of their families. The flashbacks that comprise backstories are interwoven with the present-day plot, and the two story components are generally structured to illustrate a common theme, with a character realizing something about him- or herself, or making a decision in context with previous decisions. To illustrate the use of hypertext as a storytelling mode, I'd like to examine some parallels with another hypertext work, Geoff Ryman's online novel 253. Characters are randomly jumbled together, in Ryman's train cars and on Lost's Oceanic Flight 815. They generally don't know each other, or don't realize they know each other. They suffer a tragedy together. Both narratives are replete with self-parody and self-reference, including the adverts in 253 and various elements in Lost (characters' jokes and pop culture references; repeated viewings of Dharma Initiative films, which comment on how some Lost viewers will scour episodes for subtle appearances of characters in other characters' flashbacks; and scenes such as the one from the first season in which a child reads a comic book with a polar bear on the cover - and then the polar bear inexplicably appears onscreen, a jarring anomaly on a tropical island; the polar bear then becomes a recurring threat). Furthermore, users, or viewers, may add content to both: whether submitting episodes to the projected sequel for Ryman's novel, or by participating in the Lost internet and fan community. The information delivery is similarly organized between the two. In Ryman's novel, characters' html pages are structured to include Outward Appearance, Inside Information, and What He or She is Doing or Thinking. In Lost, characters also have access to some information about each other from living on the same island, and from several preexisting relationships, but the information in their backstories (their Inside Information, and What He or She is Thinking, in Ryman's terms), is often not shared. Everyone has secrets, some of which are revealed to other characters (for example, which of the castaways is the wanted fugitive, and which was recently addicted to heroin), others are revealed only to the viewer. In hypertext narratives, the audience accesses public and private information, forming a greater understanding of the situation than any character can have. In structural terms, the series also pays tribute to video games, another relatively recent interactive means of storytelling. The introduction of new plot points is heavily foreshadowed, and when the characters finally do break through the hatch, or meet the so-called "Others", there is a sense of "leveling up," passing through a transition point at which a game becomes more complex (and more potentially rewarding). These transition points are also times when the story can become overtly fantastic; going through the hatch is the equivalent of stepping through the wardrobe, when the fantastic elements level up and new plot elements and characters are introduced. Then there are the "Easter eggs", the bonus content that rewards viewers who find the barely-noticeable connections between characters, as when Kate's mother is waiting table in a Sawyer flashback. Easter eggs provide clues for theorizing about the narrative arc and genre elements, reinforce character, and increase the "woo-woo" feeling of predestination. So hypertext describes the overall narrative structure, but it also includes other elements. 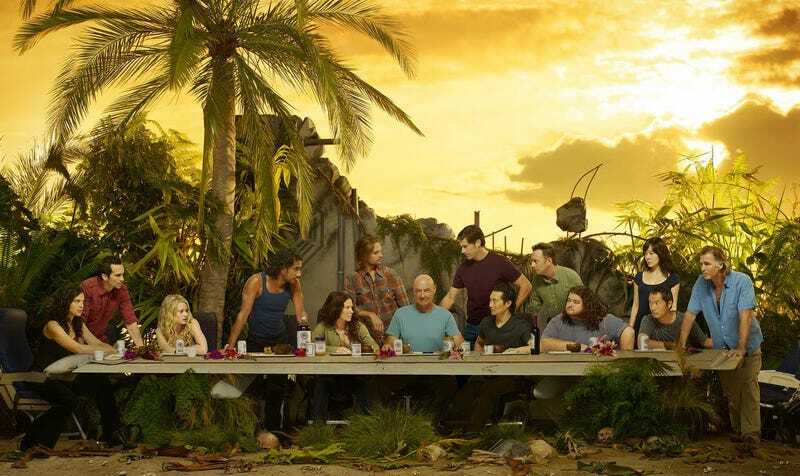 Lost is replete with allusions to other genres: in terms of visuals, the island setting comments on Survivor (this resemblance is further enforced by the alliances characters make and break), and Gilligan's Island (the comparison here is supported by shared plot and character elements). The underground settings look in turn like The X-Files and the domestic settings of sitcoms, while the idyllic community of the Others introduced in season three (in scenes including a suburban book club meeting) has both utopian and dystopian overtones. The various flashbacks are set in hospitals, bars, airports, and other locations that could easily be furniture for other TV shows; these various settings quote other media while also easily differentiating backstory from the shared, present narrative. Along with visuals, story content and dialogue reference pop culture, as done in Mad comics or shows like The Simpsons. The plots and titles of episodes often pay respects to works including Twilight Zone episodes and Stephen King's The Dark Tower series. Similarly, characters are seen reading books and stories, including Ambrose Bierce's "Occurrence at Owl Creek Bridge", a story of escape from hanging that is revealed at the end to be a dream. Casting, music, and other presentation elements also seem to be consciously making references to other works. The creators are consciously playing with pop culture (and to an extent, literature) in these decisions, all of which I think contribute to the hypertext quality. Chart by Christina G. from Uncharted Island. Outside of the actual show, another portion of the hypertext content is the community being created, similarly seen in video games that form a diverse online culture representing both the manufacturer and users. For those who want them, there are both network-sponsored and fan-created websites; plus fan conventions; podcasts, including one starring the producers of Lost; two-minute "video diaries" broadcast on users' cell phones; and the standard smattering of commercial products: spin-off novels; magazines; trading cards; DVDs; apparel; quasi-academic essay collections; and so on (Fernandez). There's even a society for academic study. Lost is evidence of a new kind of cultural creation made possible by technology, where viewers can access and contribute to a huge internet-based fan culture, and are no longer dependent on network broadcast schedules. The new level of convenience provided by DVDs and pay-per iTunes downloads make possible - or at least provide support for - a level of complexity in previously established plot and character developments that would otherwise discourage casual viewers and limit the audience. In a post-TiVo world, this blending of content with marketing encourages audience participation at a variety of levels, from simply catching up on missed episodes to producing regular punditry. Lost is of course not the only show that could be read as hypertextual in this multimedia sense; numerous genre shows like Buffy include pop culture references and self-parody, and have developed online fan communities. Other shows have official extracurricular content as well; producers for Six Feet Under regularly wrote eulogies and detailed character backstories on the show's website, and writers for Nip/Tuck and How I Met Your Mother maintain character blogs (Fernandez). Nor is user-contributed content new to TV, with genre fan writing going back at least as far as the original Star Trek, and "fan fiction" in various guises long a part of the science fiction community. However, there are several distinctive reasons for choosing Lost as an example of a hypertext narrative, in terms of story content as well as the resulting community. Lost is in part a mystery, and its numerous self-references and references to television, literature, gaming, and other cultural creations are clues as well as jokes, essential for developing plot, character, and theme. Much of this development happens through episodic flashbacks, which highlight the nonlinear transactions between characters as well as the privileged audience point of view. Furthermore, Lost's online community has a greater level of interaction between the show's creators and fans than I've observed with other shows, made possible in part by newer internet technology like blogs and podcasts (some from the show's creators) unavailable to older shows. Interactions between the text and viewers also occur in the show itself, such as the characters' repeated viewings of Dharma Initiative films, commenting on the way some Lost viewers look for clues - which the producers cheerfully provide by means of internet articles and fake "commercials" for the Dharma Foundation. This blurring of content producer and content user, made possible by easy internet distribution, helps differentiate Lost's online community from other fan communities. The show's creators have succeeded in making that Holy Grail, a commercially successful cult hit which seems intended to be read as hypertext (or at least as a postmodern cultural mash-up) from the complicated and multilayered episodic story content, with its reliance on references, as well as the interactions encouraged between the show and the fan community. In terms of commercial success, it's easy to argue that any successful show will have commercial tie-in products, and that selling related products is not new nor noticeably hypertextual. But some of Lost's tie-ins mimic user-based content: for example, speculative essay collection Getting Lost: Survival, Baggage, and Starting Over, edited by Orson Scott Card (BenBella 2006) is essentially composed of fans theorizing about what is "true" in the show. Other tie-ins add to the show's metafictional content, like mystery novel Bad Twin, by Gary Troup (Hyperion 2006), "written" by a passenger who died shortly after the crash. While it's far more likely that Lost is sold on iTunes for financial reasons than artistic ones, its availability and commercial tie-in products widen the cultural footprint of the show and help add to its hypertext quality. I also want to talk about genre protocols with regard to hypertext content, especially the way Lost seems to cross-reference different, and sometimes contradictory, genre protocols. Lost is at least in part a science fictional narrative, with such elements as the aforementioned polar bear on a tropical island, a hatch in the ground that leads to a mysterious underground complex, and a smoke monster, possibly of nanotech origin: the story includes elements from science fiction, fantasy, horror, mystery, romance, suspense, and other genres. The characters are a strange group: Hurley, who seems to have been cursed after winning the lottery, his winning numbers found written on the outside of the hatch; survivalist John Locke, who miraculously recovered the use of his legs when the plane crashed, and who shares the name of the philosopher known for the "Tabula Rasa"; Sayid, the former Iraqi intelligence officer whose knowledge of torture has been used more than once; and Kate, who regularly hallucinates a chestnut horse (also seen by another character). The characters represent a variety of ethnic, socioeconomic, and professional backgrounds, allowing for a rich mix of personalities and skills. In addition to the survivors of Oceanic Flight 815, the island is inhabited by the "Others" (now there's a classic science fiction theme), who appear both as brutish savages and in normal clothing. The Others have inexplicable knowledge, including the full and correct names of all of the characters (some of whom go only by nicknames), and seemingly nefarious purposes, occasionally kidnapping and drugging the survivors. Then there's the crazy French woman, Danielle Russeau, who was part of a scientific expedition, and who is also stranded on the island (where a number of other vessels have shipwrecked); her name references the philosopher Jean-Jaques Rousseau, who proposed that humans are born into a state of innocent wildness. In addition to the island's odd and unlikely inhabitants, the island itself seems to be obeying fantastic protocols. Some of what characters see is passed off as hallucinations or dreams, or possibly ascribed to psychic power. One unquestionably science fictional moment happens when two characters from two vantage points see the smoke monster and one of them stares it down. In addition to these characters and events, the fantastic content is also supported by crisis escape and survival plots, and the recurring themes of faith versus science and group versus outsiders. Lost has fairy tale aspects as well. In terms of fantastic protocols, there is the computer in the underground complex, where characters have to enter Hurley's lottery-winning string of numbers in order to reset the clock every 108 minutes. This action is an example of the Doctrine of Conditional Joy, "the common motif in fairy tales of offering a great boon to the protagonist on the condition of not violating a seemingly arbitrary taboo" (as coined by G.K. Chesterton, cited by Wolfe, Critical Terms, 20). Arbitrary actions that are forbidden (or required) are often part of fairy tales, with the corresponding problem that the action (or failure) will bring about something terrible. The characters in Lost are told that the action must be done, but not why. For a time, they end up choosing the certainty of nothing happening over the possibility that something might. When Locke (a character who otherwise generally represents faith rather than science) decides to stop inputting the string of numbers into the computer, a strong magnetic field quickly develops, threatening the building's integrity and the characters' lives. Until that point, entering the numbers was one of society's unexamined rules, as in Shirley Jackson's "The Lottery", or possibly Margo Lanagan's "Singing My Sister Down", that the community must enforce in order to sustain itself. Now that the doctrine has been disobeyed and the fairy tale consequences made clear, the plot levels up, with new information and new problems. While it's likely that a television show enjoying commercial success will strive to keep its audience by wrapping up questions as slowly as possible, the very nature of plot demands some sort of resolution. The question put forth by hypertext narratives, as the threads between characters come together to make a common history, is why these characters are connected, why these things are happening. Another essentially hypertext creation, the 2004 movie Crash, is about connections between characters, meeting seemingly by chance but finding connections as we learn more about them and as they meet again. The narrative structure is circular, starting and ending with the same scene. Crash is a rather self-conscious Hollywood movie, set in Los Angeles and focusing on racial, ethnic, and economic stereotypes. The explanation provided for these not-entirely-random connections is that people are so isolated, so untouched, that we "crash into each other just to feel something". Rather than explaining anything about the connections between the characters, this comment reinforces that the why of these connections is not going to be explained. And perhaps it doesn't need to be explained. world, but it can still change the moment…" (reprinted in The Locus Awards, p390). I'm going to treat "art" and "story" as the same for the present argument. Aside from the evidence that hypertext (or at least a focus on connections, determinism, and free will) is not a new structure, Kessel's story comments on the nature of storytelling; that a story is not always a means to an end or a platform for a message; therefore a resolution is not always necessary. Lost, because of its lack of overall resolution thus far, provides generally satisfying sub-plot lines with occasional resolutions, while building up more mystery. It would be easy (but perhaps not necessary) to reopen the Wells/James debate about whether the novel (or the narrative) is art or entertainment; hypertext narratives seem to play with this division between the Jamesian internal world of characters' backstories and the Wellsian external world of the larger plot. This division between internal and external might make hypertext the logical extension of the episodic narrative. Hypertext is a storytelling mode with an emphasis on nonlinear narrative. While there is an arc in Lost; episodes build on each other (and provide little catch-up for viewers who are not already familiar); along with other hypertext narratives, there is a sense that the audience will never quite find or synthesize all of the information. Some fans take this as encouragement to try to figure out where it's going, but perhaps the open-ended lack of synthesis also reflects the basic nature of hypertext as episodic, not necessarily dependent on resolution in order to be complete. To go back to Ryman's 253, one doesn't have to read every page in order to understand the shared setting and characters or the thematic playing with storytelling and narrative arc; there is no proper order in which to read the character pages, and the open format doesn't invalidate either the story or its comments on storytelling. Perhaps, then, the nature of hypertext disallows a satisfactory resolution, for both the plot and the fantastic elements. Jeff Jensen, in one of his regular columns on Lost for Entertainment Weekly, sums up the show (and its audience) as follows: "Lost is a mythology show about mythology shows; it dramatizes the romance of mystery and the impulse to impose order on chaos and how the two compliment and nullify each other; it shows how far we'll go to find something to believe in - and how far we'll go to not believe in anything" (Jensen). Perhaps the small worlds in Lost, the connections between characters, are, like the movie Crash, an anti-Hollywood statement: that there is no easily packaged story arc, and therefore the meaning is up to the viewers to decide. But, still, it is TV. Lost is at least linear in format, and complex enough to ask that viewers see every episode in order. Halfway through the third season as of this writing, it's too early to really see the larger narrative arc (and this lack actually adds to the hypertext qualities, since we don't know which story components might eventually pay off - even if the larger story arc is satisfactorily resolved, there will likely be unresolved elements, as well as fan-created content that will prolong story content, if not the story arc). At any rate, we can guess, as many theorists continue to do in various websites and podcasts. The fantastic elements are as yet inconsistent, but will probably be collapsed under one set of genre protocols, either as fantasy or as science fiction. Despite my presumption that resolution isn't entirely necessary or even forthcoming in hypertext works, all of the hypertextual connections between characters show that this story starts way before everyone got on the plane; this level of connection imparts a sense of causality and motive, a sense that this exact present was inexorably fated (or designed), and that there will therefore be some kind of resolution. On the basis of current evidence from the program and extratextual "features", it seems increasingly likely that the fantastic elements will eventually be resolved in science fictional terms. Whether derivative and dumb - "wake up everyone, it's all been VR!" - or original and provocative, it's difficult to predict in a narrative deliberately striving for a lack of closure via self-conscious Hollywood melodrama and hypertextual mythmaking. Hypertext is an interactive (generally internet-based) format, sort of the equivalent of a hyperlinked Choose Your Own Adventure book (though these are more generally about making the "correct" decisions to produce a desired outcome). Hypertext as discussed in this paper could even be a way of critically approaching text. Robert Philmus, in the preface to his recent essay collection Visions and Re-Visions, claims that the essay volume is a hypertext creation to the extent that "whatever revisionary insights it yields may well vary relative to the sequence in which its constituent chapters are read" (Philmus xiv). This approach to hypertext, like browsing the Wikipedia, emphasizes the nonlinear potential for connections within an essentially linear essay volume (which can be read in order, or not). Though television as a medium is necessarily linear (as opposed to the nonlinear nature of internet-based hypertext), the emphasis in Lost is on unfolding the common histories of the characters while they move towards the presumably shared resolution of their predicament. There is a theory that the polar bear is conjured by the child Walt's nascent psychic powers; this explanation would decentralize the self-reference by turning the event into a sort of cause and effect, further developing the genre protocols. Another instance of self-parody I liked was the introduction of the characters from the tail end of the aircraft, who landed separately from the rest of the group. The story of the "tailies" is almost a Next Generation-style sequel, with parallel characters (both groups have a doctor, a survivalist, etc., and a married couple is reunited when the groups come together). The tailies have the same information; technology; problems: they even have their own mysterious bunker. While this technique of introducing new characters has the effect of stalling the plot, the parallels are another example of hypertext, and the story itself seems to parody the preexisting program by anticipating its sequel. The audience is therefore the (semi-)omniscient viewpoint. From Clive Thompson's post, "Forget Film, Games Do Sci-Fi Best" on his blog, Collision Detection: "When J. J. Abrams and Damon Lindelof were writing Lost, they explicitly modeled it on a video-game world: An overarching mythology and a cohesive world-picture, slowly revealed through creepy exploration by the main characters." From: http://www.collisiondetection.net/mt/archives/2006/02. Co-creator Damon Lindelof admits to being a Stephen King fan, and "appears to have placed many references to King's work into Lost, referencing most notably The Dark Tower series" ("Lost" Wikipedia). Also see: http://www.lostcasts.com/2005/12/stephen_king_an.html. Casting could be considered as hypertext content, referencing actors' previous roles: Dominic Monaghan played a hobbit in The Lord of The Rings, other actors appeared on The X-Files, CSI, and in Matrix movies; Michelle Rodriguez's role as the tough ex-cop might be a reference to her other roles including movies Resident Evil or Girl Fight; then there's William Mapother, who plays creepy Ethan, and who is Tom Cruise's cousin. We could say this much for any TV program or movie, but I think that at least some of the casting is purposeful. For example, Hurley and Sayid tune into Glenn Miller's "Moonlight Serenade" on a short-wave radio; Miller disappeared in 1944 while on a plane believed to have crashed in the English Channel. While the prose of the spin-off novel I looked at (Lost: Secret Identity by Cathy Hapka) is awful, it's interesting to note that the story is not one of a main character, but a character who disappears after figuring in only a few episodes (though of course, the photo on the cover page is of one of the main characters). The Society for the Study of Lost: http://www.loststudies.com/ includes a "peer-reviewed e-journal"; photos, and other writing. ABC was the first network to partner with Apple to offer the show electronically. So far, Lost is the most popular, with about 400,000 downloads (Fernandez). This figure does not include peer-to-peer file-sharing networks. The pilot episode was nominated for a Hugo award in 2005's short form dramatic category; the series has also won Golden Globe and Emmy awards. This is the Dharma Initiative, the somewhat scientific organization responsible for the underground bunker. The definition for "Dharma" includes "[t]he principle or law that orders the universe; individual conduct in conformity with this principle; the essential function or nature of a thing" (Dictionary.com). The Dharma Institute seems to be central to the genre elements on the island, the meaning of the word also suggests that it is the center. Possibly the only element so far that is witnessed by two people is the tree-destroying black smoke cloud, which Mr. Eko faces down while Charlie watches. I'd also like to mention a book called When Our Plane Hit The Mountain, a historical account of a group of French Girl Guides (essentially Girl Scouts) who experience a plane crash on their way to Ireland in 1946, just after the war. A story of an accident is perhaps well-suited to the hypertext format; this book is structured such that we see glimpses of individual French girls and women, Irish country folk, and others, who come together because of the plane trip and the crash. There are also interwoven portions on history, aircraft technology, and Girl Guiding, to round out our perspective of this world. I'd argue that this narrative is essentially hypertextual in content though basically linear in format: the information is episodic, connections happen basically by chance or coincidence, while the story centers around a singular event, the plane crash. For examples of characters, there's the cop who molests a woman and later pulls her out of a wrecked car, forced to ask for her trust in the process; then there's the former partner of this cop, who had witnessed and objected to his partner's molestation of the woman, who ends up killing one of the other major characters over a misunderstanding. Crash's self-conscious Hollywood content includes "good" and "bad" cops, a TV director, and a bit of movie magic wherein a little girl's invisible cloak protects her and her father from a gun in an entirely explained turn of events. This is a technique that has been used in movies before, as in 1998's Playing By Heart, where several independent narratives converge at a family reunion, and in literature including Thornton Wilder's Bridge of San Luis Rey. Kessel's point in this story seems to be taking the Wells position in the Wells/James debates, that the novel was whatever the author chose to make it; Wells also made no claim that his novels were art, and that novels served other purposes as well. This position in turn might lead backwards again to the art-for-art's sake debate; I'll quote from Oscar Wilde's expression in his preface to The Picture of Dorian Gray. " The artist is the creator of beautiful things. To reveal art and conceal the artist is art's aim. The critic is he who can translate into another manner or a new material his impression of beautiful things. The highest as the lowest form of criticism is a mode of autobiography. Those who find ugly meanings in beautiful things are corrupt without being charming. This is a fault. Those who find beautiful meanings in beautiful things are the cultivated. For these there is hope. They are the elect to whom beautiful things mean only beauty. There is no such thing as a moral or an immoral book. Books are well written, or badly written. That is all. The nineteenth century dislike of realism is the rage of Caliban seeing his own face in a glass. The nineteenth century dislike of romanticism is the rage of Caliban not seeing his own face in a glass. The moral life of man forms part of the subject-matter of the artist, but the morality of art consists in the perfect use of an imperfect medium. No artist desires to prove anything. Even things that are true can be proved. No artist has ethical sympathies. An ethical sympathy in an artist is an unpardonable mannerism of style. No artist is ever morbid. The artist can express everything. Thought and language are to the artist instruments of an art. Vice and virtue are to the artist materials for an art. From the point of view of form, the type of all the arts is the art of the musician. From the point of view of feeling, the actor's craft is the type. All art is at once surface and symbol. Those who go beneath the surface do so at their peril. Those who read the symbol do so at their peril. It is the spectator, and not life, that art really mirrors. Diversity of opinion about a work of art shows that the work is new, complex, and vital. When critics disagree, the artist is in accord with himself. We can forgive a man for making a useful thing as long as he does not admire it. The only excuse for making a useless thing is that one admires it intensely. All art is quite useless." I'm defining ‘episodic' using the Genre Evolution Project definitions, basically meaning that a story is composed of discrete scenes; story pieces are not necessarily in chronological order, and pieces could potentially be added or taken away without necessarily changing the essence of the story. Full project definitions are available online at www.umich.edu/genreevo. One of the purposes of Capital F Fiction seems to be a means in which to understand the linear nature of time, of cause and effect: alternate histories like Kessel's "Buffalo" are one outcropping of this inquiry. In the linear narrative of most novels and stories, we go from beginning to end, comforted by the knowledge that all of the information is there, and if it isn't in chronological order, there is at least an ordered overall structure. The Genre Evolution Project has found that a substantial majority of stories in the database are structured either in linear integrated or linear episodic formats. To look at narrative style, or the order in which we get information, we can also consider the overall effect of Ted Chiang's "Story of Your Life", in which the narrator is describing her daughter's life in its entirety before her daughter is conceived; she comes to this understanding through the process of learning a non-linear alien language. The resolution of Ryman's 253 is simply the train crashing. Abrams, J.J. and Damon Lindelhof (Producers & Directors). Lost. 2004-2006. Burbank, CA: American Broadcasting Company. Brown, Charles N. and Jonathan Strahan. The Locus Awards: Thirty Years of the Best in Science Fiction and Fantasy. (2004). Harpercollins: New York. Chiang, Ted. "Story of Your Life". Stories of Your Life and Others. (2002). Tor: New York. Crash, directed by Paul Haggis. Internet Movie Database site. Accessed 28 November, 2005. Eastgate Systems, Inc. Accessed 27 November 2005. Ezis, Aaron Rene. Twenty Great American Short Stories: "The Lottery", by Shirley Jackson. Accessed 23 September 2007. Fernandez, Maria Elena. "iPods, blogs and podcasts provide quick fixes for fans." Tribune Newspapers: Los Angeles Times. January 5, 2006. Genre Evolution Project Definitions. Accessed 26 July, 2006. Hapka, Cathy. Lost: Secret Identity. Hyperion: New York, 2006. "Hypertext Fiction". Wikipedia. Accessed 27 November 2005. Jensen, Jeff. "'Lost' in E-Mails" Entertainment Weekly. Accessed 5 March 2006. Korbelik, Jeff. "Popular ‘Lost' is a Cultural Phenomenon." Journal Star, Lincoln Nebraska. Accessed 5 March, 2006. Lanagan, Margo. "Singing My Sister Down." Black Juice. Allen & Unwin: Sydney, 2004. Lost. Official website. Accessed 29 November, 2005. Philmus, Robert. Visions and Re-Visions: [Re]Constructing Science Fiction. Liverpool University Press, 2005. Reimer, Andrew, Tom Nunan, Jan Korbelin et. al. (Producers), Haggis, Paul (Director). 2004. Crash. USA: Lion's Gate Films. Rettburg, Scott. "Some Thoughts on Writing Hypertext Fiction." Accessed 27 November, 2005. Robbins, Christopher, personal blog. Accessed 27 November 2005. Ryman, Geoff. 253. Accessed 26 November, 2005. "Damon Lindelof." Wikipedia. Accessed 4 March, 2006. Wolfe, Gary. Critical Terms for Science Fiction and Fantasy. Greenwood Press: Westport Connecticut, 1986. Amelia Beamer's first novel The Loving Dead, with zombies and a Zeppelin, is being serialized in full at ameliabeamer.com, and will be published in July 2010 by Night Shade Books. She works as an editor and reviewer at Locus, the news and reviews magazine of the science fiction field. Find her on Twitter as @amelia_beamer.